THE STORY - Nine-year-old oddball Christmas Flint (Mckenna Grace) is obsessed with space and making contact with the aliens of the universe. When she finds out the prize at the 1977 Birdie Jamboree is getting her voice on NASA's Golden Record, Christmas forms her own misfit Birdie troop. Nothing can prepare them for the painfully perfect world of the legit Birdies. But, led by their reluctant yet fearless troop mama (Viola Davis) and Christmas’s dad (Jim Gaffigan), they find glory in the most unexpected circumstances—much to the despair of the ever-judgmental school principal, Miss Massey (Allison Janney). THE GOOD - An extremely likable cast, a great message and an emotional climax that makes this indie comedy a pure delight in nearly every way. THE BAD - A little too idiosyncratic at times with its humor and dialogue, thus making it a bit hard to settle into the film's rhythm at first. ​​​"Troop Zero" is one of those light independent films that is guaranteed to put a smile on your face. It's loveable, funny, filled with memorable characters, has enough style to set itself apart, and features a valuable message. It's a true crowdpleaser that features a band of misfits coming together under unlikely leadership and despite their differences and how the world perceives them, they have value and self-worth, which is something every viewer can appreciate. Christmas Flint (Mckenna Grace) is a young nine-year-old girl with one foot longer than the other, living in Wigley Georgia 1977 with her lazy town attorney father (Jim Gaffigan) after the death of her mother. She's obsessed with space and making contact beyond our planet as she believes she might be able to communicate with her mother once again. When she finds out that the prize at the 1977 Birdie Jamboree is getting her voice on NASA's Golden Record, which will reach space's ears, Christmas sets out to form a birdie girl scout troop. In order to get into the competition, the girls must first earn individual girl scout badges, which proves to be difficult due to their eccentricities and conflicting attitudes towards one another. Led by her father's assistant, the reluctant yet strong-willed Miss. 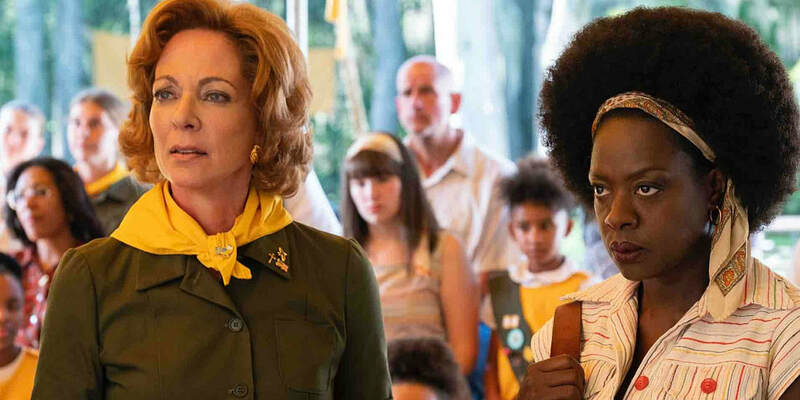 Rayleen (Viola Davis), the young group of girls may be odd to others but are determined to show their town and their judging principal (Allison Janney), what they're made of. With big names such as Viola Davis, Allison Janney and Jim Gaffigan leading the cast, it may or may not surprise some of you that the true star amongst stars for "Troop Zero" is the incredibly charismatic and talented Mckenna Grace. We've seen glimpses of her talent before in "Gifted" & "I, Tonya" and here she continues to establish why she is one of the best child actors working today. She's not alone though, as directors Bert & Bertie assemble a young cast of equally talented child actors around her to formulate Troop Zero (named mockingly by Allison Janney's character to belittle the girls). You have Hell No played by Milan Ray who is all volcanic fury and aggression. There's the femenite Charlie Shotwell as Joseph, who would rather sing ABBA rather than toss a football with his father. There's Johanna Colón as Smash, who...smashes stuff. And there's Bella Higginbotham as Anne Claire who has one eye and prays everything to Jesus. Together, they form the most lovable group of misfits since the punk rock band from "Sing Street." Don't believe me? Try your hardest not to be won over by their performance of David Bowie's "Ground Control To Major Tom" and then get back to me. Viola Davis is great as always. As the no-nonsense Troop leader, she gets to show some of her comedic acting chops and delivers one of her now famous shutdown monologues towards the end of the film which always generates a strong reception from an audience. Allison Janney goes from abusing Mckenna Grace in "I, Tonya" to doing it here in "Troop Zero" as the sneering principal Miss. Massey. She has her personal favorite girl scout troop, Troop 5, to look after, filled with the ideal version of what young girls should be like (Personified by the perfect female bully, played by Ashley Brooke). And Gaffigan is a hoot as Christmas' father, with his southern charm and lovable goofball quirks. He does have one scene towards the end of the film which involves a tearful close-up that conveys another layer of depth to his character and really helps to end the film on an emotional high-note. In short, the cast is pitch perfect and are the number one reason to check out "Troop Zero." On a technical level, the film boasts a color palette that reminded me of "Moonrise Kingdom" with its golden hues and warmth. The editing flows very well as the pace never slogs along. However, the rhythm of the film's screenplay, with its idiosyncratic dialogue and southern quips can take a bit to get into, as there are times where the film feels like it's trying too hard to be quirky for the sake of being quirky. Otherwise, "Troop Zero" is the perfect kind of a film you can sit any one of your friends and family down to watch for some light entertaining fun. So unbearably cute, touching and funny, this oddball comedy is a definite highlight of the 2019 Sundance Film Festival.